Rio de Janeiro is a city of contrasts, where one may experience the strangest shifts. Because of its stunning natural landscapes, harmoniously located in an urban context, it became known as the “Cidade Maravilhosa” (the wonderful city). On the other hand, it is also a “devastated city,” rutted by jackhammers and bulldozers, fragmented by the excesses of government and by social inequality. A city that suits the economic strength of so-called “big events” (the World Cup and the Olympics), routed in a undemocratic way, under the guise of a legacy that never comes. Where slums and large luxury condominiums live intertwined in its heart. A metropolis that exhales a complex cultural ambience, a vibrant, prolific and especially contemporary culture. It was in this space and place that an artist and his instrument, a Walkman, traced an unusual route. This image could not be more appropriate to our protagonist, since we are talking about the musician, composer and visual artist Aki Onda. Invited by Chico Dub, the curator of the Festival Novas Frequências, for a two-week residence in Rio de Janeiro, Onda ran through the city carrying out what appears to be most specific aspect of his work: the movement. Known for his Cassette Memories project — a sort of “sound diary” drawn from field recordings collected by the author — Onda uses the Walkman as a musical instrument, building sound mosaics and performances from streams and patches extracted from the recorded sounds. His performances involve a high degree of interdisciplinarity, which led him to collaborate with a wide range of artists such as Michael Snow, Ken Jacobs, Alan Licht, Loren Connors, among others. Before the contrasts brought by the city, Onda opted to collect materials in all possible environments. 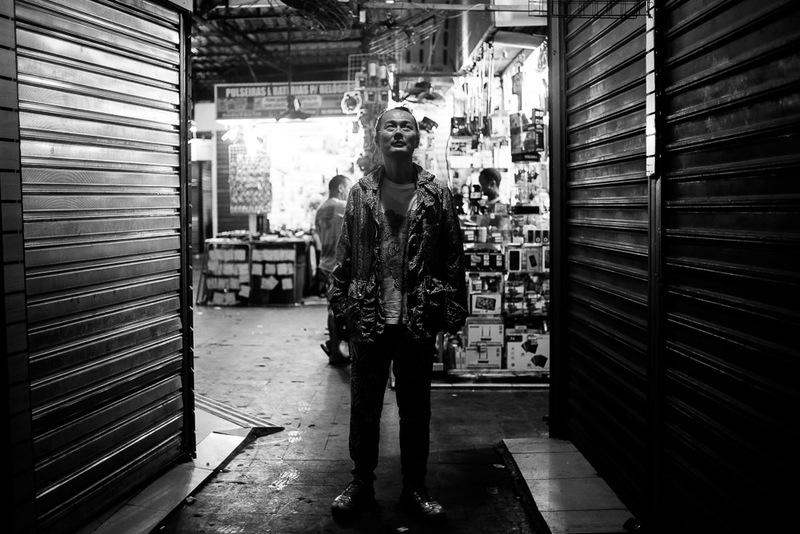 He visited Rocinha, the largest slum in Rio de Janeiro, and also met a lot of locals artists such as multimedia trios Chelpa Ferro and DEDO. He attended performances and exhibitions, went to religious places of Umbanda and Candomblé (African-Brazilian religions) and entered the capoeira circle (the Afro-Brazilian “martial dance”). In five years of Novas Frequências, perhaps no other artist has been inserted into the Rio landscape so decisively as Onda. His presentation at the festival, exposing the partial results of the residence, was one of the busiest and commented last year. In the interview below, conducted through face meetings and by email, Onda reports detailing his passage through the city. 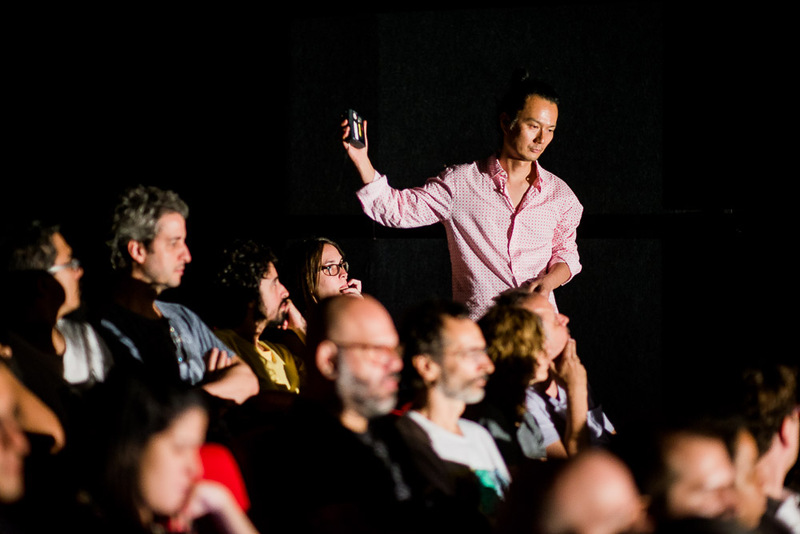 How would you classify the environment that you found at Rio’s audiovisual landscape? Which were the elements and relationships that called more your attention? Please, name the places and situations that you found more interesting. The beauty of Rio is so intense, with natural attractions such as seductive sand beaches, dramatic mountains, rain forests, and a lagoon, all close to or woven into urban areas. This geographical character certainly shapes an unusual landscape and soundscape. And, the city is transforming into new appearance, mainly for hosting World Cup in 2014 and the Olympics in 2016. Some neighborhoods, especially north of downtown Centro, are experiencing the huge construction rush, and noises – hummers, big hole drilling, bulldozers at cetera – are echoing in the air. I visited several favelas – some span hillsides and others occupy huge flat lands – very characteristic urban structures: organic clusters of do-it-yourself housings and maze-like alleyways. I loved walking around through the narrow alleys. You can hear the sounds of people’s daily lives from inside their houses since the favela is densely populated, the houses are clustered close together, and the walls are so thin. It was summertime, and windows were wide open. You can literally look and hear into the inside; no need to eavesdrop, because all is exposed to outside. You rarely find this situation anywhere else in the world. You moved through various social realities in the city, from an avant-garde music festival in the south zone to the slums. Were the social contrasts in Rio somehow reflected at your performance? Is it possible to portray in a performance the locations I visited, and my subjective view of people’s lives and vitality within society? I don’t have a clear answer. But what I wanted to do was not like finding tourist attractions. I had to go deeper in order to catch some sort of essence of this city, people and its energy. In a sense, I wasn’t trying to describe the city but extract something from the materials I collected and my experiences there. Make sense? Yes, sure! You work with Walkmans almost as a nomad, a collector that prints experiments on magnetic tapes. How being in movement is important to your work? A good point. Yes, I make my art in transit, and that’s probably based on my nature as having been a nomad for most of my life. Field recording is a perfect practice for me since I can work on it any place any moment. I have been collecting field recordings by using hand-held compact Walkmen since 1988, and the accumulation of sound memories is a trace of my geographical and psychological voyages. When I create something, either recording or performance, it’s like re-mapping those memories – a juxtaposition of times and places appears as a newly invented sonic collage. Also, the ideas I incorporate to my work always move back and forth among different fields such as music, dance, visual art, cinema et cetera. That’s another “in transit.” For the project in Rio, I modified my usual artistic routine and accustomed to a slightly different version. You’ve met some visual and sound artists at Rio. Would you tell us a little about these meetings? How did they inspired your performance at the festival? Will they somehow inspire your next works? As a strategy, beyond just making field recording, I wanted to spend some time with local artists and embrace whatever I find inspiring in the process in order to deeply dive into the city. Vivian Caccuri, who presented Caminhada Silenciosa (Silent Walk) project in the same edition of Novas Frequências, was a great help. 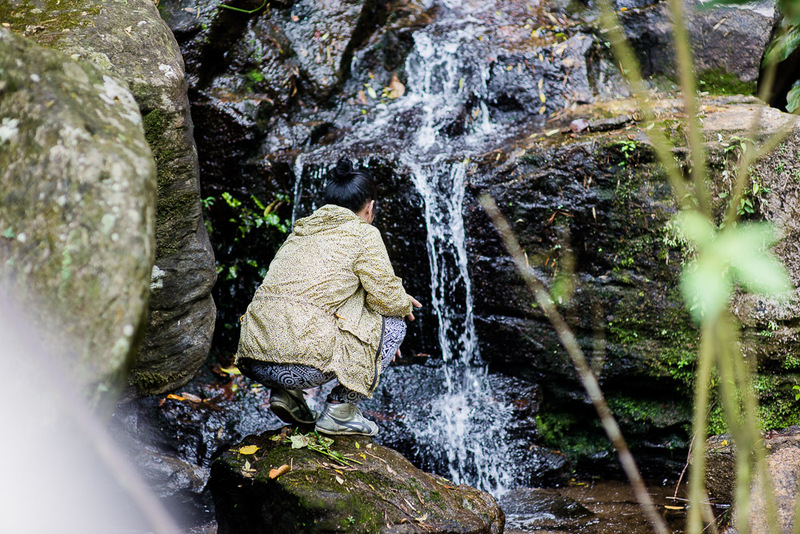 Her Silent Walk is an eight-hour sound walk exploring in a city, while participants remain under a vow of silence and focus on listening to environmental sounds. It reminds me of, or the idea is close to, Max Neuhaus’ LISTEN project during the 60-70s. Since Vivian has been presenting this project in Rio, she knows numerous good listening spots, and took me around and told me where to go. While climbing down the steep slope of Parque de Catacumba, we played whatever we found there – plastic water bottles, tree branches, a necklace she was wearing with a whistle – and recorded onto my cassette Walkman. We didn’t plan it, but it was impromptu improvisational recording, which eventually became a piece in the performance. At a group exhibition at Arte Contemporânea na Maré, I happened to meet Barrão, who is a visual artist and a member of sound art collective Chelpa Ferro with Luiz Zerbini and Sergio Mekler. I thought his works were fascinating. He creates sculptural assemblage made from found objects. He’s been obsessively collecting kitsch and colorful ceramic objects purchased at flea markets for some decades and accumulated an impressively large collection in his studio. He is also the inventor of bizarre musical instruments, which piqued my curiosity. We had a recording session in a gigantic studio space of historic Fábrica Behring, where he has a studio that used be a confectionary factory near the Centro. Now the building is converted into the artist studios. He played a motor driven percussion instrument called the “Ruim” and I taped the roaring sound with a Walkman while walking around the huge space and catching irregular echoes of the rough-conditioned ruin-like room. There were many abandoned strangely-shaped factory machines and we ended up improvising together by using them as instruments. Some more help came from Maga Bo, who is an American music producer and DJ that has lived in Rio for more than a decade. Maga Bo is vastly knowledgeable about traditional Brazilian music and is involved in a network of such musicians, incorporating folk elements into his music. 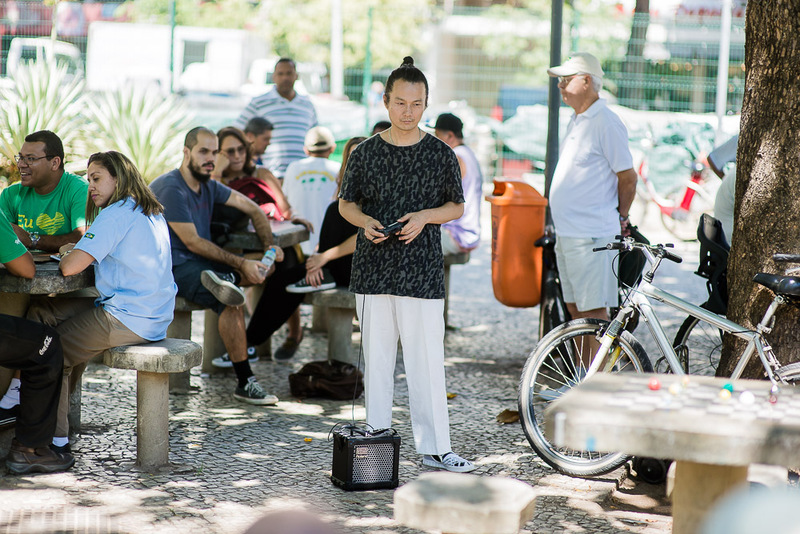 To make a long story short, he kindly set up a recording with local musicians who plays Capoeira music with berimbaus and pandeiros at a terreiro near the Central Station. The building is situated in the middle of a dirty dusty slum. The house has three different shrines for worshipping different orixás and a beautiful garden surrounded by white plaster walls. As soon as you enter the gate, you feel like the air has purified and calmed down compared to the noisy everyday world outside. After we had recorded in the garden, the father of the terreiro, a well dressed very old man with strong presence, invited us to a ceremony held several days later. So Bo and I went back there and it was such a gorgeous experience. I still don’t know what they call the ritual. The form was very close to candomblé or “macumba”. Participants, who were dressed mainly in white costumes, slowly danced by following each other in a circle with a rhythmic accompaniment of three differently-sized drums called atabaque. They chanted songs and a few of them played metal hand-shakers. Then, through repetitive movement, they experienced the axé power through spirit possession of the orixás and get into a strong trance state, one by one. It was just mind-blowing. They had three sessions in sequence, in different shrines, each decorated beautifully in a slightly different way, bringing offerings such as fruits, food, bottles of liqueur for statues of the orixás. Everything in the ceremony had a perfectly harmonious presence. It seemed important that this is a communal gathering and not a performance, therefore only the participants and a few friends were present. It is very interesting that the Afro-Brazilian religions are well known to everybody in Brazil. Whether they practice or not, in a sense it is a part of their life in a symbolic way. It’s like water running underground. You don’t see it, but it feeds an important substance to people’s life in the city. People know that “macumba” happens all the time, even the elites. It’s very well known that most of politicians promote macumba rituals in their offices since things not going so well as they expected. Many of the rituals of neo-Pentecostalism, the most widely-practiced religion today, were drawn from Afro-Brazilian rituals. I’ve been always interested in animism and shamanism, other forms of rituals to connect to spirits. I visited Salvador, Bahia, to see candomblé ceremonies ten years ago, which deepened more of my interests. When Chico and I started planning this residency for the performance, I had images of that sort of ritual strongly in my mind. In each recording you’ve made here, we detected materials sounds, voices, ambiences and situations that you registered. However, when you use them, there is an extra sense due to the “musical” way that these materials are presented. Those sounds capture a subjective experience, but this outspreads as these materials fit the musical form. Tell us how do you compose. I am not sure if it’s just “musical” since my performance consists of several different elements such as visually arranged stage set-up, special lighting, movement of body, et cetera, operating as a whole composition. The form of musical movement is certainly an element, however, due to the nature of field recording and other materials. Field recordings are always “sound” but depending on the environment in which it was recorded, visual information is present in them. If I record the sound of rain, the listener can imagine rain or water in their mind. Because of this, concrete sounds can conjure up images more easily than musical notes. It’s not impossible to create a sound montage as if editing these conjured-up images. Indeed my compositional approach strongly adopts the idea of “cinema for the ears.” And also, it’s a collage work – juxtaposing different times and locations (“experiences”) I went through. I’m like a magic realist, however. I’m interested in creating an alternative reality from the concrete sounds I corrected, which appear as if a new image or an experience alien to me. I’m not interested in re-producing the reality itself. I assume my composition/performance doesn’t have a sense of documentary, although the flow may be suggest some sort of ambiguous fictional story, manipulated by the imaginations of both myself and the audience. At your performance, I’ve noticed that on each tape on stage there was a set of experiences. Were the tapes edited or were they played continuously? What were the concepts or materials that factored into the performance’s design? How do you organize this material conceptually? I had two weeks to collect field recordings and made about forty tapes. Some of those were 30 minutes, and others were 15 minutes duration. Mostly I used the 30 minute tape for recording a long shot and the 15 minute tape for short fragmented snapshots. On the surface of each tape, I wrote down what sort of sound and where in the city it was recorded. On top of this, I added visual collage made of disparate printed materials I found in Rio. This is so I can easily recognize a shape and colors of collage on cassette visually on stage – I have terrible eyesight, and only use my right eye since the left eye is a half dead. All tapes are original raw material, strictly no editing, but when I perform or compose I manipulate sounds by using pedals or other processing devices. 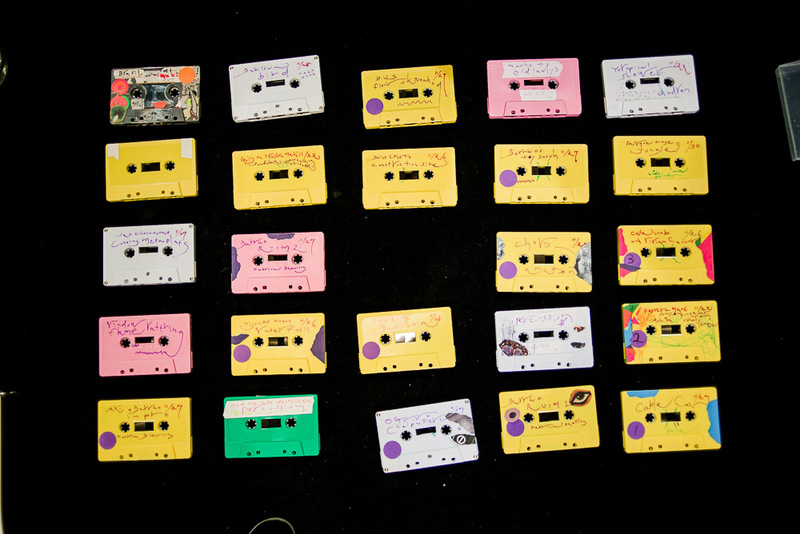 The way I compose the order of tapes is almost like a visual score. There is a timeline detailing the order of tapes I tend to use, and other cassettes are organized by types of recording such as ‘ambient noise’, ‘percussive sound’, ‘voice’, ‘radio’ et cetera, as tools for improvisation. Please tell us about how you conceived the stage setting for your performance in Rio. It was a spectacle-slash-performance and not really a music concert. I installed found objects on stage setting and created a sort of a shrine for a ritual, similar to the sacred terreiro I experienced at the ceremony. There were bells, primitive wooden flutes and whistles, a window chime, broken cymbals, et cetera. The visual presentation is as equally important as the aural presentation. Indeed in this animistic sort of space, everything has symbolic potential – aesthetic, cultural, or emotional value. Everything has equal eminence and there is no hierarchy. The lighting of your performance was the most interesting of all the festival because it seemed to tell a story, it had a certain “narrative”. Could you tell us about the use of light in the overall conception of your performance? Lighting is becoming more and more important to me. It certainly changes how things look, sets a mood, and psychologically affects the aural and visual perception of the both performer and audience. These days, I often control the whole lighting system and play a lighting mixer which I place next to my musical equipment. I know no musicians do this… why not? This time, because of the venue’s system diagram, it was a bit difficult to set a mixer on stage. So instead I wrote a detailed lighting score for the technician. I had two choices during the residency this time… No. 1, spend as much time as possible exploring the city and collecting field recording. No. 2, spend less time field recording and more time composing. I willfully decided to go for the former option, and only gave myself one day to compose the sounds I amassed. Because of this process, I wrote a lighting score before finishing the musical aspect. In fact, I improvised a lot on top of the basic structure I composed – the lighting also worked as a score for the improvisational portion. There was a particular concern in spatializing the sound, making it circulate around the room. The spatial distribution walking through the room is common in your work or was inspired by a particular situation in the city? I mean, this feature was inspired by the city? In which way? First of all, what I create is a non-directional soundscape. I don’t use the PA system and instead I use bass or guitar amps at scattered positions in the venue as sound sources. By carefully examining the architecture of the space, I actively use reflection of sounds. For instance, amps can be facing a wall so that the sound spreads along a wall to the ceiling or floor and that forms a particular three-dimensional sound shape. Or… depending on the position and direction of an amp speaker versus wall, this makes fluttering echoes bouncing back and forth in the room. I also carry a portable amp, and the cassette Walkman has an attached speaker, so sounds literally move as I walk through the venue. As a result, you hear sounds surround you. The entire space becomes an aural environment by ignoring the concept of “concert hall” situation, in which the performer and audience is separated by the stage and seating area. l would like to “blur the line” and question the relationship between the performer and audience too. Yes, this can be an analogy for the city, or any sort of physical space outside the venue. 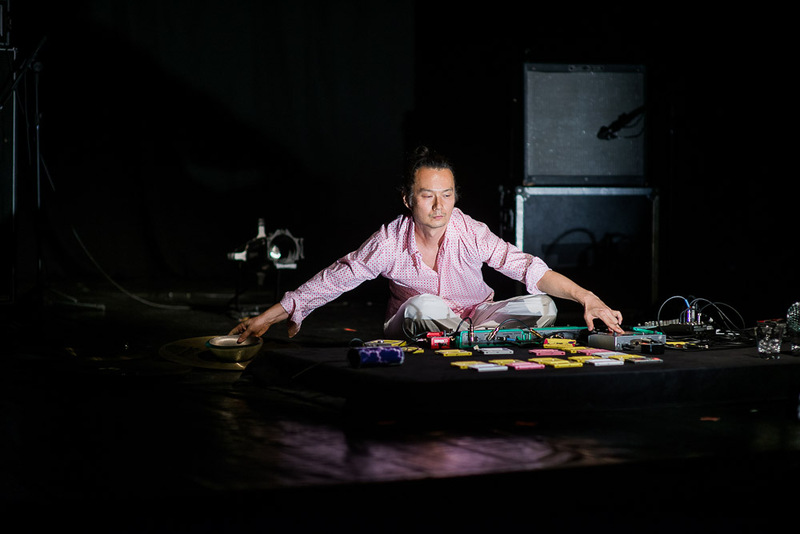 Field recording captured something that had originally existed in three-dimensional physical space, and bringing similar kind of dimensions to the venue would make sense as opposed to the idea of listening to music in a conversional concert hall situation where sound only travels from the stage to audience. Whether amplified or not, the direction is strictly one way and the sound tends to be flat or two dimensional. At the same time, the relationship between the performer and audience is fixed, with a hierarchy as the giver and taker. I do think it is an passive experience for both as they just follow the conventional habit. I am looking into if there are other possibilities, and in fact there are so many. After having done some experiments, I realized that a barely audible low volume sound can be as violent as aggressive loud noise assaulting your ears. Also, it helps me to catch full attention and concentration from the audience. They wonder what is going on and face this unusual situation by trying to hear more; beyond this point, their ears open up and enter a realm of micro-perception. Suddenly, they start hearing all subtleties – pin drop noise, delicate shift of hiss and hum, a hidden melody inside field recording, and even next person’s breath… It’s a bit like taking a hallucinatory drug, then your sensory becomes surprisingly sharp and keen. And, to be precise, it’s not just about the volume. I’m transmitting strong energy though the sound, through my palms. It’s a technique close to Qigong (Chi Gong) or Reiki, based on Eastern medicine practices, and it’s all about energy control. On other words, if the audience can catch strong energy, the sound volume doesn’t matter, as those are coupling together. I’ve read an interview in The Wire magazine, a quote called my attention: “Cassette Memories is not an arty project or an intellectual game. Rather, it’s more like my obsession with keeping memories. I’d like to transform my music or visual work into something beyond my control and imagination to the point I feel like, ‘What the hell is going on?’” Why is so important to keep memories? And why is important to give it away, transforming memories into something that you know that you won’t be able to recognize? Is Memory a creative power in your work? Let’s say I’m into MAGIC – phenomena overwhelming consciousness, or simply something beyond. By moving away from the usual time and space in which we operate, by freeing us from reality, it shows you another kind of reality. The artistic creation is able to invigorate people and fill them with excitement and joy. I believe in that sort of magic, through different art forms. I believe that’s an important function within society. Yes, I did stress MEMORY during the process of developing my work. However, I’m interested in human memory system itself – how we remember and forget things, or how we modify or manipulate memories to something else as time passing by. Although I have been doing field recordings as a diary for twenty five years and use my personal life as a model case, it’s not like telling you what happened on me as a sense of documentary. During that process of archiving my field recordings, so-called memory, I try throwing them into the void. It’s actually more about forgetting something. I have to cut the bond with the original meanings first. Then, I’ll be able to use them for re-creating the other meanings. I’d like to make it impressionistic and open to the others. What are the advantages of using cassettes in the performance compared to the use of computers, drum machines, etc? It is perfect for me to use the cassette medium to re-create the alternative reality, or magical something, which I mentioned. The cassette modifies the original recorded sounds in a very characteristic way. The frequency range will be compressed, the texture will be distorted and some overtones and hiss noise will be added. I like maximizing this potentiality of transforming sounds into something else. And, it is a bit similar to the quality of Super 8, or grainy black and white photos. There is rough and coarse feel with the medium. So, in a sense, it doesn’t have to be cassette. Either it’s sound or visual, I like things that are damaged, destroyed, scratched, wrecked, and far from perfection. It’s not just about aesthetic, but it’s something deeper. How do you describe this? Is this a feeling? Is this a religious feeling? I don’t know what exactly and where exactly it comes from, to be honest. Definitely not about religion, and I’m not a religious person. Some people need religion in order to get authoritarian permission to access their scared place. But, I am an anarchist, and I don’t need any authority to control me. I just connect myself to those places, and I can find those places everywhere. I think there is clear difference between people who go to a terreiro to practice candomblé, or that sort of syncretic religion, and people who go to a church. The former, they connect to spirits and represent the sublimity themselves. But, the latter, the sublimity is given by the god. In a terreiro, there is certain kind of openness – for instance, even outlaws, transvestite people are welcome to share the experience. I feel quite comfortable going to a terreiro, but not a church. The artist Aki Onda does not seem to follow any kind of theory, is not tied to any specific tradition. You are a nomadic artist that navigates through many areas and segments. Does the same thing happen to the art you produce? Is it an art without influences of schools or tradition, which produces no followers? The truth is: my art is strongly rooted in the history of the New York avant-garde, and I’m a lineage of artists such as Harry Smith, Joseph Cornell, Jack Smith, Peter Beard, Richard Foreman, Stuart Sherman, and so on. That tradition of everyday object junk alchemy occultism influenced and haunted me more than any others when I developed my art. I started visiting New York quite often back the late 90s, and one of the reason to be there was to know more about avant-garde cinema. I wanted get in touch with Jonas Mekas since his films influenced me tremendously when I was a teenager. After we met around 1998, he supported my work a lot and organized two of my photo exhibitions at Anthology’s gallery. He even helped me to get a US Visa. He indeed gave this sort of support to many other artists as well. Through Jonas and Anthology’s environment I encountered works of Ken Jacobs and Michael Snow, and that eventually led me to collaborate with them. Anthology was one of the best places to absorb the essence of New York avant-garde. In fact, if you look into the visual art and cinema, you can find more of references related to my art practice. Am I a loner? That may be the case, or may be not. For sure I am a marginal figure though. Still I have been sharing interests with some sound artists. Akio Suzuki, who is known for performing with self made instrument, such as the Analapos and De Koolmess (Suzuki-type Glass Harmonica), both invented in the 70s, and his sound walk project oto-date started 90s, where he finds listening points in the city and invites audience to stop and listen carefully at given points on the map. We are interested in investigating aural and visual qualities of natural and architectural spaces, and exploring and expanding possibilities of site-specific performances. Beginning last year, Akio and I started combining forces with David Toop and Rie Nakajima. David and Akio have been long time collaborators, and it naturally happened. All together, and sometimes as a smaller group, we questioned the nature of listening, performance and space. Indeed the bottom line is “question,” without following conventional rules of performance practice, or just ignoring those. I think we can also apply the same strategy for other format of presentations – exhibition, publication, workshop et cetera in the future. It is re-examining ideas and thoughts for finding new possibilities. May be this is a bit of the Salon des Refusés, and we are happy to adopt old forgotten possibilities as well. By the way, I was reading Charlemagne Palestine’s interview online, and he referred himself as the Ali Baba of the 21st Century. I’m unsure what exactly this mean, though I suppose I am kind of the same. I admire Charlemagne as his artistic creation makes one nothing but ecstatic. But it doesn’t make you think. In the world of “arts,” the thinking part can be quite often overdone. His idea of not thinking and experiencing something as a whole body is fantastic. Your presentation at Rio reflected for me a certain conception of the Zen. I wonder what would you think of it: “I do not associate Zen with emptying the mind through meditation, but to the control of the movement. Throughout that conception, that I assume as imaginary, the Zen would correspond to an art of calculation: every gesture, every idea, every device operates according to a strictly drawn plan”. Not sure if my art is related to Zen… However, I admit there are similar sort of qualities. When I perform, I have to get into a trance state. Through deep breathing, I hypnotize myself before the performance, empty my mind, and stop the stream of consciousness. A calm takes over. A Zen illumination? Possibly… Or, sometimes my mind get into that zone after I start playing the first sound. It is strong meditation and concentration – sense of time gets quicker, even though things get much calmer and slower. Because of that, the duration can become longer or extend, without the audience feeling so, as they work into a sort of hypnotic state. If I get into the strong trance state, the audience induce it. It’s a communal experience. When I am in this state, every moment I have clear articulation for whatever I do, as you mentioned. It’s full control, or maybe opposite… Because I don’t have to control anything as things happen naturally and automatically. However, I think many other artists adopts similar sort of technique, and I don’t particularly feel what I am doing is very original, from that perspective. I even think this is something “authentic.” Or… maybe this sort of bona fide is something missing in the current art performance or music scene and that’s why an artist like Charlemagne looks out of the ordinary, or strange. This may be a key to understand my art, or even Charlemagne’s, or even some others like us… It’s a sort of syncretism – different artistic forms are combined and collaged in a complex way – and during the process of decontextualizing, or more precisely self-contextualizing, something very unusual or hard-to-define reveals. Far away from pureness or purity, we are like the Black Madonna! I knew that for Brazilian people it’s easier to sense the essence of my art because they have a very complex society and history, and they have ability to accept its complexity as it is. They are good at nurturing the contradictions or tensions created by crashes of different forms too. There was an exhibition at Museu de Arte do Rio (MAR) during my stay titled “From Valongo to Favela: The Imaginary and the Periphery,” which was about the history of Rio’s Port area. I learned that Brazil received four million enslaved Africans, the most of any nation and ten times compared the US. It is indeed different from Western countries. Or, the opposite situation may be Japan where I was born and grew up. Their society and history is simpler and far more homogeneous. It’s harder for them to understand my art, which is “mixed blood.” And, probably that’s why I moved to, or escaped to, New York City, and developed my own artistic codes, language and system there. I like a port city such as New York City and Rio de Janeiro that have certain kind of openness to accommodate cross-over, hybrid or even schizophrenic meanings to art and life. I feel comfortable being rooted in those complex social, historical, and political constructions. Well… New York has very much gentrified and has been losing that sort of character on the surface level, and possibly at deeper levels too. It’s cleaner and flatter than ever now. Somehow some parts of Rio reminded me back-in-old-time New York City and its chaotic messiness and greater sense of freedom. There was a film by photographer Miguel Rio Branco shown in the exhibition at the MAR. It portrayed street life in a favela – daily chronicles on dirty back alleys, in shabby houses and obscene brothels with saturated and haunted colors – which somehow recalled the 70s debris like Downtown New York captured in Jack Smith or Ken Jacobs’ films, or even the mid 90s still gloomy and edgy Lower East Side or Brooklyn streets I landed around that period. Memories echoed in my mind, and I was trying to think what it was… Ten Years ago, I visited Rio for the first time, and apparently the city has cleaned up compared from that time, although it looks like people’s life still has depth even now. Faster than ever, this voluptuous city, Cariocas and its energy have been drastically changing, and I wonder it will be like the future. Since 2011, Novas Frequências is the main brazilian avant-garde music festival, based in Rio de Janeiro and curated by the producer Chico Dub. “Macumba” is a generic name to a very specific kind of brazilian Afro-religious development, which consists in a cultural movement called syncretism: African-diasporic religions meeting Catholic symbols and philosophy. Harry Everett Smith (1923 – 1991) was a visual artist, experimental filmmaker, record collector, and self-taught student of anthropology, widely known for his influential Anthology of American Folk Music. Joseph Cornell (1903 – 1972) was an American artist and sculptor, one of the pioneers and most celebrated exponents of assemblage. Jack Smith (1932 – 1989) was an American filmmaker, actor, and pioneer of underground cinema. Peter Beard (1938 – ) is an American artist, photographer, diarist and writer who lives and works in New York and Kenya. Richard Foreman (1937 – ) is an American playwright and avant-garde theater pioneer. Stuart Sherman (1945 – 2001) was a performance artist, playwright, filmmaker, videographer, poet, essayist, sculptor and collagist. David Toop (1949 – ) is an English musician and author, and professor and chair of audio culture and improvisation at the London College of Communication. Rie Nakajima is a Japanese artist working with installations and performances that produce sound. In the colonial period (XVI century – XVIII), the natives born in the city of Rio de Janeiro were known by two names: “Carioca” because of the Carioca River. (…); and “Fluminense”, a reference to the Latin term flumen, which means “river”. But the term “carioca” is, of course, of Tupi (local indigenous language). Its significance, however, is controversial. There are several theories about it. We choose two of them. Carioca means “white man’s house” by joining “kara’iwa” or “kari” (white man) + “oka” (home). Is the name of an ancient village tupinambá that existed at the foot of the Outeiro da Glória, in one of the two mouths of the Rio Carioca, in the current quarter of Glória neighbourhood. According to this version, the “carioca” name would come from the Tupi terms “kariîó” (“carijó Indian”) and “oka” (“home”), meaning “carijó’s Indigenous home”. All pictures by Eduardo Magalhães/I Hate Flash.